The Ministry of finance made an announcement last week on the changes relating to residential property. Most people who own private properties would be happy to hear about this news as some measures have been relaxed. While many people hope for the ABSD and LTV limits to be relaxed, the government is not doing so yet. This ABSD and LTV limits has been a pain point for people who want to purchase a second residential property. Sometimes the additional stamp duties and cash down payment required just makes it senseless to purchase another property. Interest rates are still low now so they will certainly not relaxed these measures. I would think when interest rates goes up further, then these measures will be relaxed. The SSD will be relaxed in this round of announcement. This SSD was introduced to prevent people from flipping properties (ie buying and selling within 4 years to make money). HDB has a minimum occupational period (MOP) of 5 years while private properties do not have thus the SSD was in place to prevent speculations. 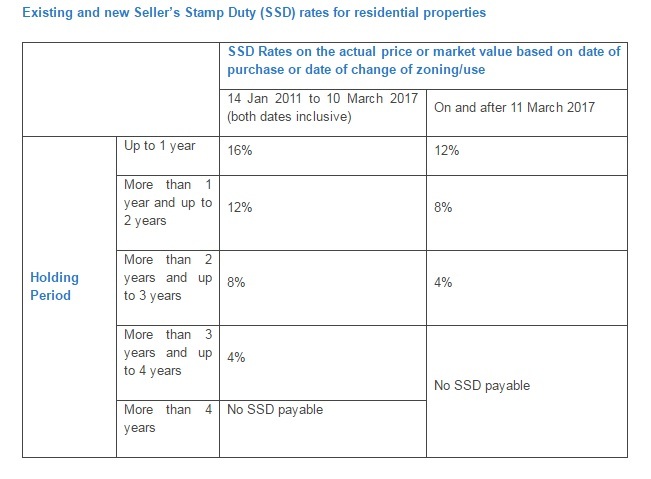 For the changes, the SSD will only be imposed on properties which are sold less than 3 years, down from the current 4 years. The % will also be reduced by 4% for each tier. Do refer to the below image for the breakdown of the %. The TDSR will be tweaked too. The current TDSR is 60% where all the monthly loan instalments we pay should not exceed 60% of our monthly gross income. This 60% will remain the same for most of the loans except for mortgage term/equity withdrawal loans for cashing out of private properties. The TDSR will no longer apply for mortgage equity withdrawal loans with LTV ratios of 50% and below. This means if your net property value is 1 Million and you get a $500,000 or less cash out from your property, you'll not be subjected to the TDSR anymore. Simply said, it is easier to cash out of your private properties now. If you're interested to cash out of your private property, you can contact me through this form and I'll assess your situation and advise you accordingly on the best way to do it. An Additional Conveyance Duty (ACD) will be introduced. This is aimed at significant owners of equities interest in PHEs that can include partnerships, trusts and companies. This means that those entities whose residential properties in Singapore form at least 50 per cent of its total tangible assets will be captured in this new requirement. This ACD is quite confusing but doesn't affect most of us anyway unless we have equity interest in PHEs. You can read more about this here. Many property developer stocks moved up last week in response to some of the measures being relaxed. In my opinion, I don't really see much impact unless the ABSD and LTV limits are relaxed as well. This is just a minor change to the residential property market. However, with the relaxation of the mortgage equity withdrawal loans, I think there will be more cash flooding our economy soon. I love good deals so when I heard of this new credit card by Standard chartered, it seems too good to be true. Standard chartered bank always try to come up with good deals to attract consumers. From a consumer point of view, this is definitely good news. For example, many years back they had this savings account which gives 2% cashback on any spending if we use the debit card. I used it to pay for my university course fees and got quite a lot of cashback in return. The time round, they have just launched a similar card with unlimited 1.5% cashback on all spending. There is no cap and no minimum spend required. This is very different from the other credit cards in the market which only gives you points or cashback for certain types of spending. There is often a minimum spend too to be eligible for the cashback. This is not the case for this new unlimited cashback card. This card can also be used for public transport with automatic EZ-reload top up function. 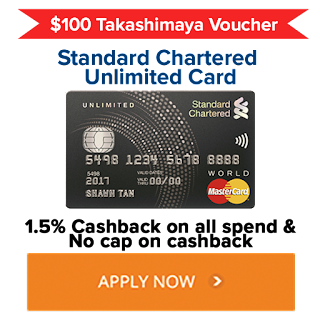 I have found another additional promotion where you can get $100 Takashimaya Voucher on top of the gifts SCB is giving. The $100 voucher will only be given if you apply by clicking on the above image. Be sure to follow the instructions on the page to claim your free voucher. One more thing, the card has 2 years annual fee waiver so we don't have to worry about paying for the fees upfront. If the SCB unlimited card does not suit your needs, there are other cards having promotion as well. 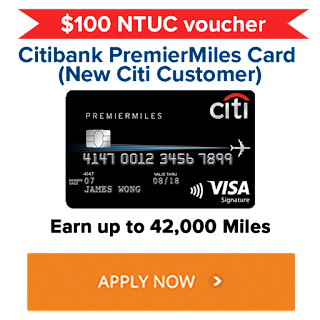 If you're a frequent traveler, the Citi Premier Miles card is a must have. You can collect "miles" and exchange it for a free air tickets later. I checked Citibank's website and it seems like they are giving out $120 cashback for new card members. 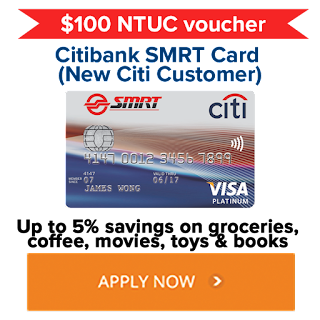 On top of that, if you apply through this link, you'll also get additional $100 NTUC vouchers (Applicable for New Citi Customers only). There are many other cards on promotion too. Check out this link for more details. Remember, you'll not get the vouchers if you apply through the bank directly. The promotion is only valid till 31st March 2017.
Credit cards are useful but never spend more than what you can afford. Spend smartly and wisely. Multiple Streams Of Income - Can It Be Done? The fear of having not enough money or losing our job makes one think about how to create multiple streams of income. It has been a popular topic since many years ago in this uncertain world we live in. Just these few months, I've heard a few people got retrenched. This makes me wonder when will I be next? However, when we are already so busy with our work, how do we even have more time to create more streams of income? Its quite impossible to take up another part time job or even do freelancing when time is so tight for everyone. So, how can we create more streams of income using the least amount of time and is this realistic? Let's take a look at how it can be done. If you're thinking of whether dividends from stocks can possibly be a source of income, the answer is yes. There are real life examples of people who manage to create $10k or even $100k of dividends through stocks. A few of my financial blogger friends have already achieved that. However, nothing comes easy. Through my conversations with some of these friends who have already done that, let me share what did I find out. The first step to creating dividends from stocks is to save up. Without any investment capital, there is no way we can get dividends. Maybe you think you can invest $1000 and get $10,000 easily. The reality is not the case. Many people make their first pot of gold when a crash happens. This greatly increases our investment capital which will be useful for dividend investing. Many multi baggers are made during a market crash. This means we could make more than 100% return on our investment on a single stock. This kind of opportunity doesn't come all the time so take advantage of it when you see it. How to know which stock to buy? This brings me to the next point. Buying stocks at the right price is all about knowing how to value a company. How much is the company really worth? There are many variations on how valuation can be done If you read it up on your own, most probably most beginners will get confused. The most basic form of valuation is the PE ratio. There is no one fixed number we should look at. A PE of 20 for one company compared to another company with PE of 10 doesn't mean much if we do not understand what is it about. The PE ratio is calculated by taking the Price (Stock Price) divided by the Earnings (Earnings per share) of the company. If the Earnings of the company drop sharply and price remains the same, PE ratio will be a very high number. Similarly, if stock price goes up a lot while earnings remain the same, the PE will be very high. As such, a low PE is generally better than a high PE. If we just base on PE from the above, M1 seems to be most attractively priced. Does it mean we buy M1 straight away? The answer is no. 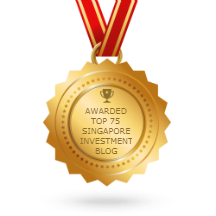 Previously I wrote an article about how Starhub went wrong as an investment. It is a lesson that if we buy at the wrong price, the whole investment can suffer. Valuation has a second part where we try to project the future PE. We have to ask ourselves if we buy M1 at current PE ratio, is it really attractive? The PE ratio is low now base on current price and earnings. If earnings of M1 drop further, the PE will shoot up again. Most of the time, the stock price will also drop to reflect a fairer PE ratio. Earning drop and price drop will re-balance back the PE. Another scenario is where the PE is not that low now but we predict that earnings will go up. If earnings really go up, the PE will be lower thus making it more attractive. The most ideal scenario is where the PE is low now and we also predict that earnings will go up. Most of the time, the stock price will go up thereafter to reflect the valuation. In summary, PE ratio is useful for valuing a company base on its price and earnings. A PE of 1 means the company is making a profit that is equal to its price. Let's say a company has $100,000 worth of stocks (investors money) and it made earnings of $100,000 that same year, its PE ratio is therefore 1. PE ratio can also be described as the number of years it takes for investors to get back their money. There are many other valuation methods such as using the price to book ratio which is a valuation of a company's assets. Some investors use other models such as calculating the intrinsic value or looking at the cash or free cash flow. It will be confusing if we're not finance or accounting trained but all these can be learnt if we are really determined to do so. 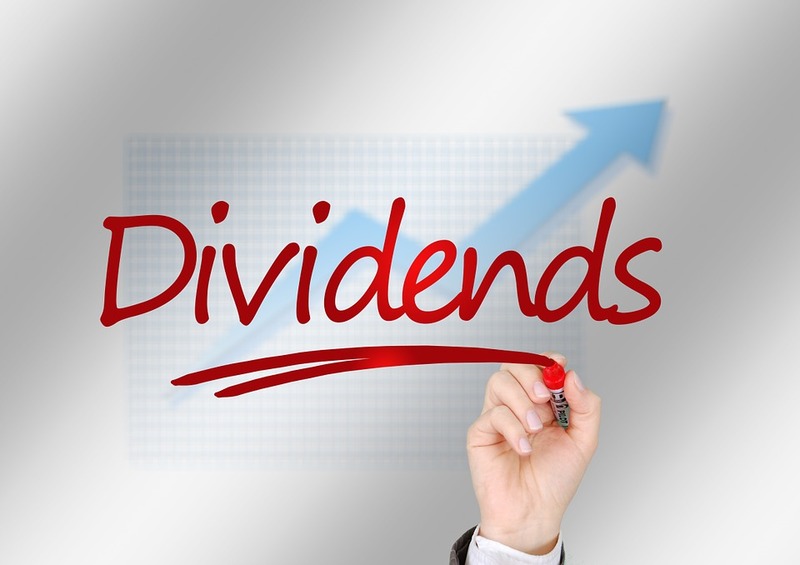 Getting dividends from stocks doesn't mean we just go for the stock which has the highest dividend yield. Since we are investing into these stocks to get a second source of income, we want the income to be stable as well. When companies pay out dividends, they have to get the money from somewhere. If a company has a payout ratio of 100%, this is unsustainable in the long run. It is likely the company will reduce its dividends later on. A company who pays out 100% of its profits in dividends do not have money to continue growing and expanding. Another thing to look at is whether the companies' profit will be stable? If profits are not stable, it is likely the dividends will be affected later too when earnings drop. With limited time, it is honestly quite hard to create more sources of income. We can build websites, publish books, sell items, do freelance etc. But, all these take time and effort. 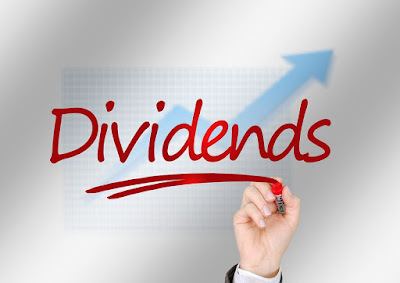 To me, I would think dividends from stocks is an achievable stream of income. The hard work is certainly needed at the start but as time goes by, we will get more and more familiar. We can buy a company and hold it for the long term while monitoring its financial results only once every quarter. If you realise, there are some very stable stocks which gives good dividends in Singapore. In that case, we don't even have to monitor much. Take the first step to invest and create a second stream of income!